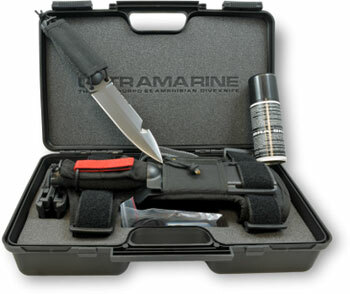 Extrema Ratio Knives for sale are designed to meet the most severe military standards. Extrema Ratio is based in Prato, Italy and has been creating functional knives for military use since 1997. Each Extrema Ratio knife is hand assembled and hand finished, inspected and field tested. Their knives are all made from Austrian N690 Cobalt Stainless Steel which is tempered thus producing a strong and flexible blade with superior edge retention. Their knives are designed and developed with cooperation from the Italian and foreign armed forces. 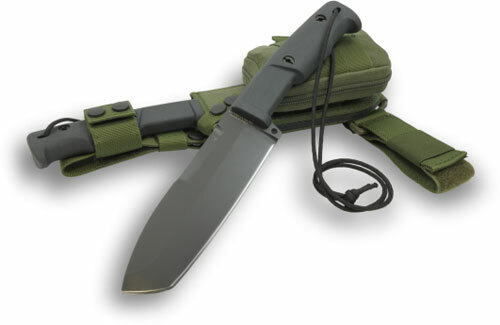 Buy these popular knives by Extrema Ratio for military and functional use. Extrema Ratio Psycho 19 Desert Camo Knives for sale are 13 inches long. The Psycho 19 features desert camo laser engraving on the blade and is made in Italy by Extrema Ratio. They feature an Austrian N690 Cobalt Stainless Steel 7 3/4th inch blade. The 4mm thick blade is engraved with Psycho 19 near the handle. The handle is crafted of tan Forprene. These knives include a coordinating tan nylon belt sheath. 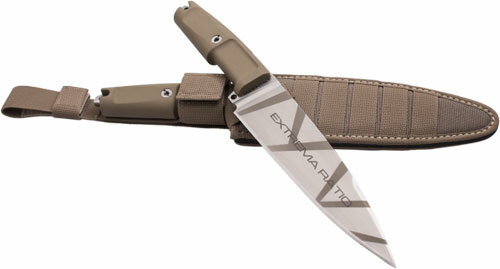 Buy the Extrema Ratio Psycho 19 Desert Camo Knives for $249.99. Extrema Ratio Selvan Knives for sale are 12 ¼ inches in all. These military knives are made by Extrema Ratio in Italy and are designed with Daniele Dal Canto, a master instructor of FISSS, the Italian Survival Federation. The Selvan is a modified version of the Ontos military knife featuring a longer handle and heavier blade. They feature an Austrian Bohler N690 Cobalt Stainless Steel 6 1/4th inch blade. The blade finish is MIL-C-13924 Burnishing. The knives include a heavy duty, reinforced nylon belt sheath and have a black Forprene handle. Buy the Extrema Ratio Selvan Knives for $606.99. Extrema Ratio UltraMarine Knives for sale are 11 5/8th inches in all. The functional Extrema Ratio Ultramarine is designed for dry and wet use featuring Forprene for the grip polymer. The textured handle may be carefully disassembled from the knife so it can be attached to a pole or spear. The 5 5/8th inch Austrian N690 cobalt stainless steel blade has a black matte finish. The blade has a partially serrated top edge and line cutter. The black ABS and nylon belt sheath features arm or leg straps. Buy the UltraMarine Knives made by Extrema Ratio for $659.99.